Do we want real connections established between employees, customers, partners? How can we reward those in our ecosystem who actively contribute? Do we actually want to engage those who want to engage us? Can we? As this post's subject indicates, my interest here is to explain how social network analysis, applied to the ecosystems of organizations, helps apply social business design in a manner that avoids the fallacy of open/closed business cultures. We can't know how open or closed a business culture is until we research, analyze, and understand both its formal and informal networks. To paraphrase Valdis Krebs, a social network analyst, more connections are not necessarily better...Valdis Krebs, and other social network analysts engaged in ONA (Rob Cross and Steve Borgatti, for example) contend that the most efficient and effective adaptation to emergent challenges lies in "the pattern of direct and indirect links" in the ecosystem. You can read a straightforward overview of ONA by Valdis. This post continues David's line of thinking by considering a combination of two of his strategic questions in light of the open/closed culture fallacy. I also take a stab at noting how to answer his last question. How Do We Know Who Connects in, and Contributes to, a Social Business Ecosystem? ...Typically, leaders are able to guess only about 30 percent of the key brokers in a network and thus are often not leveraging a critical resource in their organization. To better understand what this means, let's think about the meaning of the word broker. Brokers, at least in terms of social business design, are people in organizational networks, as Cross and Thomas note, who "keep the entire network together by virtue of their relationships across subgroups and formal structure." 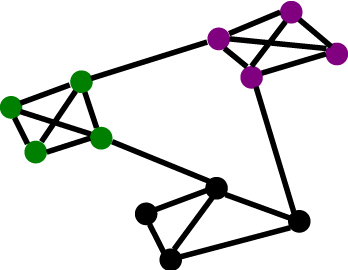 Brokers span the structural holes in social networks to connect subgroups. The subgroups are sometimes inside the organization, existing in functional silos, and sometimes outside, as business partners, professional colleagues, or key customers such as lead users. Every organization includes brokers, regardless of how closed it may be culturally. People discussing social media typically refer to brokers as influentials, though brokerage involves more than mere influence. Considering the first quote from Cross and Thomas in light of this point, the knowledge most leaders of large organizations assume they possess about brokers usually fails to incorporate the tacit, informal knowledge sharing and work practices existing among stakeholders in the hidden social network of their organization. An organization can be more, or less, closed than its leaders assume. Social business strategists do well to keep this in mind as they approach projects. David's key strategic questions require substantial design research before an answer is possible for any specific organization. It is inaccurate to assume that the leaders of complex Fortune 500 organizations know enough about their culture to answer the three strategic questions posed by David. The culture of a business, just like its brand, is not defined by its leaders now, if it ever was (I'm gonna catch some flack from that point). Nevertheless, leaders certainly are essential in developing strategic vision, serving as social role models, and providing the authority needed to engage the brokers in the organization's social network who can, in fact, change a business culture. A number of conceptual frameworks and heuristic methods are offerred by those discussing the strategic challenges faced in bringing design to business culture and organization. The challenges are framed as design thinking, workplace effectiveness, hybrid thinking, social business design, or a range of others. As you can probably tell by my choice of headings, I tend to use the latter term. Regardless of terminology, the real challenge involved is how to balance the differences between the way business currently gets done, and the innovations, or transformation, necessary to incorporate dynamic flows of communication between stakeholders inside and outside the organization while maintaining a shared mindset, and delivering a pleasant experience to customers across touchpoints. Steelcase slightly modifies the design thinking approach, mostly identified with IDEO,and provides a CbP (Community-based Planning) model for how to research and analyze informal organizational culture, as evidenced in the everyday work practices and social network of the organization. CbP uses social network analysis to visualize the informal, trust-based relationships existing in an organization. Much like traditional ethnographic field techniques, where selecting good informants is key to successful anthropological investigation, CbP uses the relationships highlighted through social network analysis to select key people for its in-depth observational research into the cultural dynamics of organizations. CbP is a nice example of how to use quantitative and qualitative research methods to serve empathic purpose in the design challenge recently highlighted by Peter Kim of the Dachis Group, namely to design physical environments that support the cultural dynamics of social business. I've written about the framework used by the Dachis Group in its approach to social business design several times. The Dachis Group offers a unique framework, with four distinct archetypes, to approach social business design. My analysis of the WaterCooler Project at HP offers insight into how the metafilter, dynamic signal, and ecosystem archetypes relate to the design and implementation of social computing within large organizations. Dynamic signals consist of the constant multi-faceted means of collaboration, e.g. email, wikis, blogs, twitter-like apps, etc. Metafilters, such as monitoring social media sites, tagging internal communication resources by topic, keyword, person, as well as federated search, etc., provide methods for finding signals in vast amounts of noise. A key challenge is figuring out how to shape the connections within the enterprise, and with consumers/customers, to support the relationships needed to influence the flow of learning in directions that create strategic value by recognizing which signals are important. David Armano calls this discernment. I'd suggest it is more precisely mutual recognition of value on the part of business stakeholders. Mutual recognition of meaningful signals in large-scale noise is more likely when people in multiple functional areas experience a shared view of how to create value through collaboration. More recently, I discussed the importance of empathy to bolstering the collaboration necessary for developing and maintaining the sort of shared experience implied by the hivemind archetype. Employing a social business design strategy in any organization, whether its business culture is more open or more closed, best begins by mapping out its social network. Social network analysis, when used to study organizational networks (ONA), provides visual heuristics for managing dynamic signals and metafilters as part of an enterprise social computing strategy. Additionally, ONA provides social business design with the ability to more effectively engage organizational brokers with observational methods like ethnography. At that point, a social business design strategy can answer the last question David poses regarding whether members of an organization who can change its culture from the inside actually want to engage stakeholders, inside and out, in new ways. Such a mix of ONA and ethnography makes it clearer how much of what Adaptive Path's Jesse James Garrett, and others, refer to as the frozen middle exists in a client organization. In my opinion, the Dachis Group framework offers the most coherent model currently available for approaching the topics involved in designing social business. That doesn't mean it is the only way, as we've seen with the Steelcase example. But, so far, it offers the most specific visualization for how the components of the process relate. Developing a working model to shape the practice of social business design is the next key challenge.